Eating is the best part of being a human. We have the luxury of easy access to the best food, unlike animals who scavenge and kill for their meals. I’m very grateful for this, because if I was an animal I’m not sure I’d even make it to adulthood. Unless I was a sloth. I wish I was a sloth. Anyway, I’m getting side-tracked here. Basically, food is life. Naturally, when I’m travelling, I like to search for the best food I can find in any given destination, and I want you to be able to find them too! So here is the first of a series I like to call ‘The Best Eats’. The first stop on our journey? Rarotonga, Cook Islands, of course! Do you love cheap burgers? Then you’ll absolutely love Palace Takeaways! 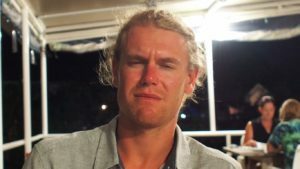 Located near the harbour in Avatiu, Palace Burgers offers really cheap, tasty burgers all day. Visit on Wednesdays and you’ll find that the burgers are a ridiculous $3.50 for happy hour, which is too good to pass up! I actually lost count of how many Palace burgers I ate during my time in Rarotonga, they were just too good to resist. The fish burger is probably the best, though the Palace burger is highly recommended. Just don’t attempt the Palace burger unless you have an empty stomach – it’s huge! Palace Takeaways is quick, tasty & affordable… what more could you want? 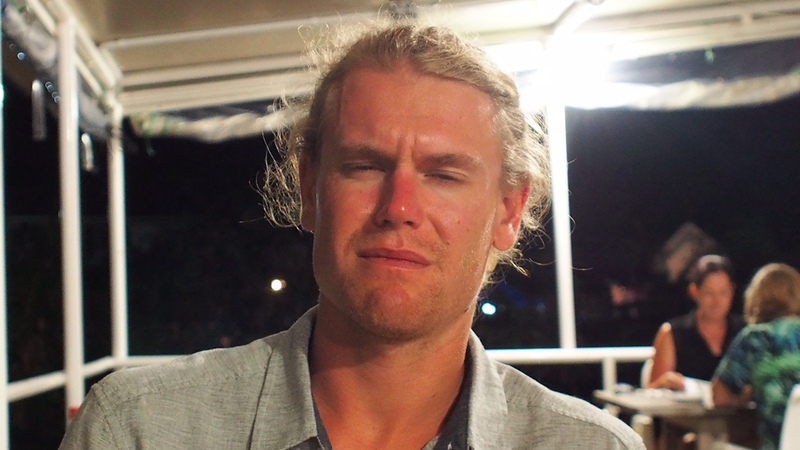 Runner Up: I couldn’t write about the best burgers in Rarotonga without giving a special mention to the Roadhouse Bar & Restaurant. Since it was across the road from the Edgewater Resort & Spa, we made this great little place our local on our first visit to the island. Just as cheap and almost as delicious as Palace Takeaways, the Roadhouse doubles as an awesome bar with $3 happy hour beers and spirits. Also, if you love music as much as I do, you’ll also appreciate their weekly karaoke night and live entertainment! A burger the size of your head at Charlie’s! If you’re looking for value for money, you need to visit Charlie’s Café & Beach Hire. 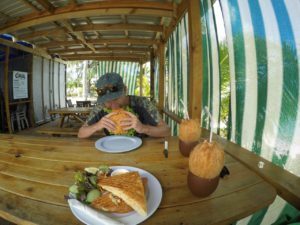 You’ll find it on the edge on Akapuao Marine Reserve in a little beachside shack, Charlie’s is well-known in Rarotonga for having the largest burgers and sandwiches on the island. No kidding, they are absolutely huge! Scott got applauded by two older couples who wandered in for a feed after we’d gotten our food. They all ordered a burger to share between two, while Scott sat behind them and demolished one to himself! At Charlie’s, you’re guaranteed to get a tasty meal for a good price, plus you can hire beach toys like stand up paddleboards and kayaks for after lunch adventuring. Check out their Instagram page here! You can’t visit Rarotonga without eating at Trader Jack’s. The exceptional yet affordable menu is full of great food & drink, and you always get service with a smile. The restaurant overlooks the beautiful waters of Avarua Harbour, and you’re bound to have the best view in the house from pretty much any table. We’ve eaten here a few times on both our trips to Rarotonga, and have never been disappointed by the incredible menu and affordability. They have the freshest seafood on the island, so I recommend ordering the Fish of the Day, as it will be amazing no matter what type it is! You better like cats though, since the resident kitty loves to wander around diners looking for cuddles, and won’t hesitate to jump on your lap mid-meal! Also, don’t forget to buy a bottle of their famous hot sauce to take home – you won’t find it anywhere else, and it’s too good to leave behind. Located in the Punanga Nui Market, the Waffle Shack offers amazing food and incredibly friendly service. Known in Rarotonga as the best coffee on the island, the Waffle Shack is also famous for its fruit-laden homemade waffles (while the tropical fruit & cream waffles are great, I strongly recommend the Nutella waffles – oh my). The little café is actually owned by the same family who ran the Airbnb unit we stayed in on our second trip to the island, so every time we went for a coffee or a sugar hit, they’d always take the time to sit down and have a chat with us, make sure we were having a great time, and that we were enjoying our sweet treat! I’m sure they’re just as friendly with everyone who visits, so don’t miss them if you head to Rarotonga. Check them out on Facebook here! We stumbled upon the Shipwreck Hut during one of our sunset walks along the lagoon. With funky vibes, tasty food and cheap cocktails, we ended up visiting almost every day! Located within the A’roa Beachside Inn, the staff and owners are incredibly friendly, funny, and make the effort to talk to everyone who stops by. As an expatriate couple originally from the United Kingdom, Steve and his wife Geraldine truly have an amazing life. In fact, Scott and I told them to call us if and when they were ready to sell up, though we may be waiting a while for that call! There’s live music every couple of nights, including performances from Steve himself and his hilarious and talented staff, who sing and dance to traditional music between serving customers. A great little bar with the best cocktails on the island, you won’t regret a visit. In Avarua, you’ll find the High Tide Bar & Grill. With ocean views and cold beers at happy hour, you’ll find yourself coming here more than once on your Rarotongan holiday. The reason it deserves a special mention, however, is for their $20 pizza buffet. $20 for all-you-can-eat pizza! Anyone who knows me knows that I love pizza more than almost anything else in the world (except for travel, of course) so it’s pretty obvious why I love this place! 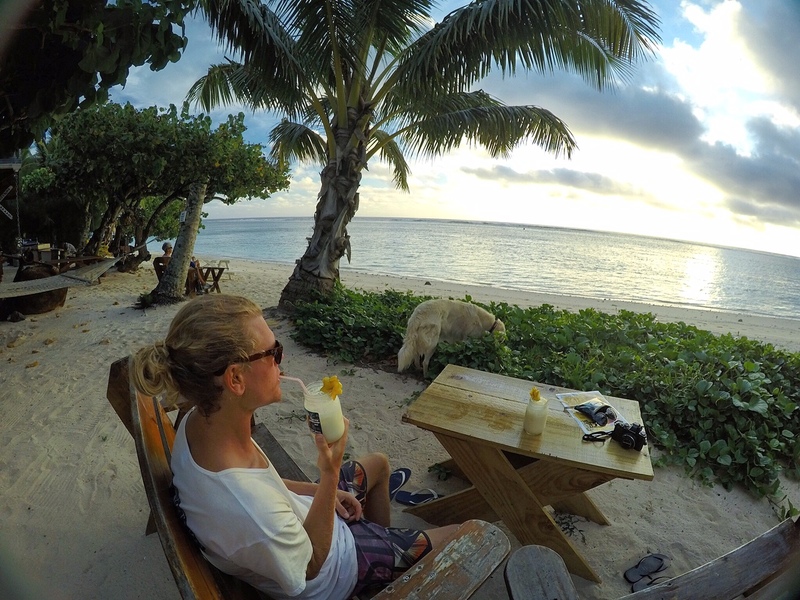 So there you have it – the best eats in Rarotonga (according to me, anyway). 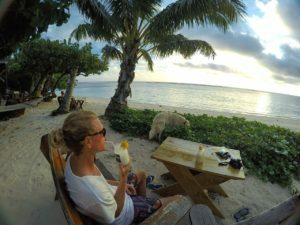 If you’ve been to Rarotonga, I want to know where your favourite places to eat are! Leave a comment or send me an email with your hot tips.